The swapit team did submit its application to the Cyberport Creative Micro Fund (CCMF) – Batch 2015. It seems our application has been attractive enough to pass us through the initial screening process and allow us to present to the CCMF vetting committee. The CCMF program is structured as 6-month project and for that period. So, we applied with a clear roadmap for the next 6 months – focusing on how we bring swapit out of beta, into full production mode and how we are planning to capture the market for trading pre-loved items in Hong Kong. That pitching session is not public. Otherwise, I would have invited all of you. Please do feel free to wish us luck, though! The swapit team is having a booth at the ECHELON Asia Summit, which takes place at the Singapore EXPO on June 23rd and 24th, 2015. Open 9am – 6pm each day! Swapit will be present on the Hong Kong Cyberport pavilion to show a demo of our app, connect with fellow entrepreneurs and investors in the region. The swapit team is having a booth at the ZERO WASTE FESTIVAL that takes place at Cyberport this weekend (June 13th and 14th, 2015). Open 10am – 6pm each day! The ZERO WASTE FESTIVAL is the grand finale of Hong Kong’s very first ZERO WASTE WEEK. It will be an interactive, entertaining and inspiring weekend family festival of all things zero waste – and YOU are invited! There will be weekend-long activities with live art installations, interactive zero waste activities, inspiring talks and an eco marketplace with product stalls showcasing the very best from Hong Kong’s green-minded retailers. Swapit will be present with its own booth to show how our app can help re-use pre-loved items in this consumption-driven society. If you want to sell / trade / swap some of your stuff, bring it to our booth and we will help you get it onto swapit! Booth: Watch out for the green swapit banner! 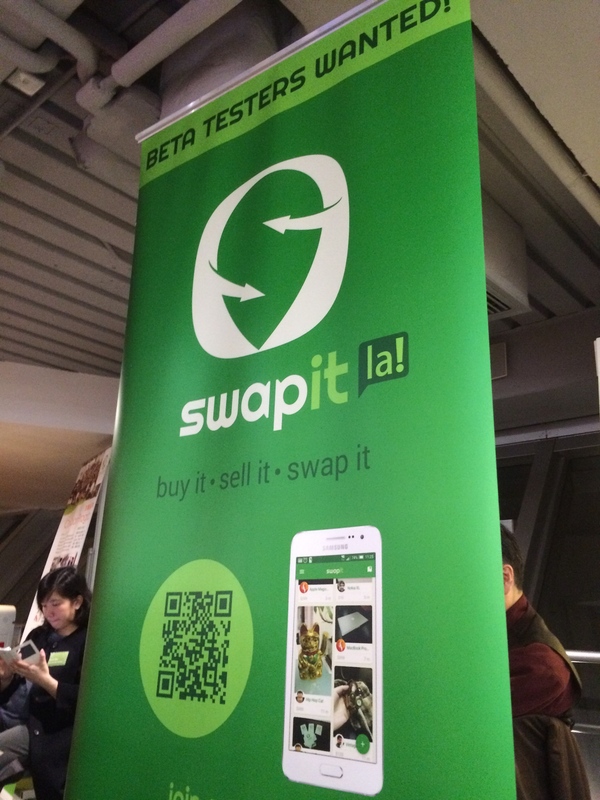 We’d love to talk to each of you, show you swapit, help you sell / swap stuff on swapit! 46. From this year onwards, free online government information will be released in digital formats to encourage development of more applications by start-ups. Many start-ups have developed a wide range of mobile applications by exploiting such public sector information, including information on real-time traffic and weather conditions. 44. In addition, the proposed injection of $5 billion to the Innovation and Technology Fund will help strengthen support for relevant enterprises. The Panel was of the view that the project was commercially viable and the project team had capability to carry out the project. Nonetheless, apparently the bulk of the R&D work involved seemed to be near completion. The Panel considered the remaining work had low I&T content. Hence, the application was therefore not supported for funding.